Nick Didkovsky (left) and Chuck O’Meara, founders of the “$100 Guitar Project,” with the now-autographed instrument. When it arrived in October 2010, a sight-unseen online purchase from Elderly Instruments, the $100 used electric guitar was a plain-looking red instrument with no name, an uncertain vintage, and a rusty, single-bridge pickup that co-owners Nick Didkovsky and Chuck O’Meara described as looking like an old radio. In the two-plus years since, however, this humble instrument has voyaged 30,000 miles across the United States, Europe, and Hawaii; and been played on, recorded, and autographed by 65 guitarists. 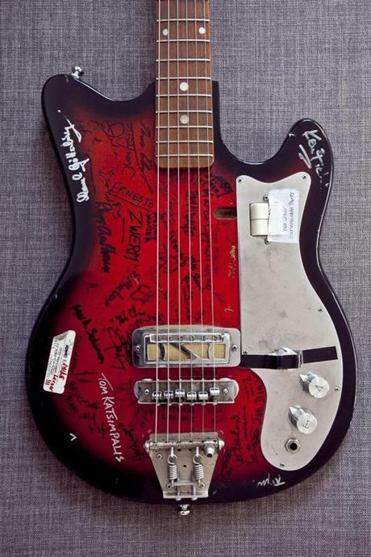 The tattoo of names now scrawled across its worn body reflects a surprising range of players, amateurs to pros, from Wilco rocker Nels Cline to classical musician David Starobin to avant-garde minimalist Rhys Chatham, including four local musicians: Michael Bierylo, Steve MacLean, Ken Field, and Roger C. Miller. Last month, Bridge Records released a double CD of the “$100 Guitar Project,” with all performer royalties and half the sales proceeds going to the humanitarian organization CARE to help fight global poverty. “There’s nothing quite like a cheap guitar going all around the world seeing what different players can do with it,” says Testament thrash guitarist Alex Skolnick in the teaser for the project’s upcoming documentary. Didkovsky and O’Meara started by e-mailing a few friends with an idea: Take the guitar for a week, create a new piece, record it, then pass the guitar on. Within 24 hours, the idea went viral, with 30 other guitarists volunteering their creative efforts. Twenty-five more weighed in the following day. The pair finally cut off participants when the list reached 65. Over the course of the guitar’s journey, it’s been strummed, picked, stroked, hammered on, bowed, scraped, plunked, bent, and shredded. It’s been “prepared” with nuts and bolts, with a kitchen whisk and a nail file jammed under the strings to create a false bridge, miked, manipulated, and routed through all manner of electronic processing. It has rocked out with Marty Carlson, gone microtonal with Larry Polansky and ethereal with Julia Miller, challenging players with its limitations to step outside their usual methodology. 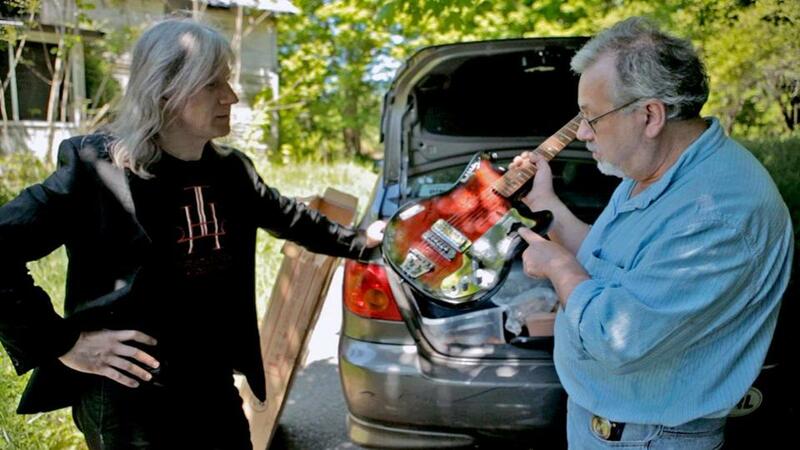 Didkovsy and O’Meara recently found out the provenance of their instrument: According to scholar Frank Meyers, it is an EJ-2, the first electric guitar model produced by FujiGen Gakki in Japan, probably around 1964. The program notes for the CD booklet describe how each artist used the instrument, offering a kind of tutorial sampler for what the electric guitar can do in the 21st century.